SAN FRANCISCO, CALIFORNIA – Today, Breast Cancer Action, respected watchdog organization of the breast cancer movement, launched their “Knot Our Pink Ribbon” campaign, calling out The Estée Lauder Companies’ pink ribbon betrayal on the 25th anniversary of their well-known pink breast cancer awareness ribbon. Breast Cancer Action’s 2017 Think Before You Pink® campaign, “Knot Our Pink Ribbon” calls on Estée Lauder to stop the betrayal and be honest that empty awareness cannot “create a breast cancer-free world;” that positive thinking cannot prevent a woman from being diagnosed with or dying from breast cancer; and be honest about the chemicals of concern in their products and commit to the highest standards to protect womens’ health. In addition to their Breast Cancer Campaign (formerly the Breast Cancer Awareness Campaign), each year in October Estée Lauder sells a variety of pink ribbon products, distributes pink ribbons at cosmetics counters, spearheads large events to illuminate international landmarks, and hosts star-laden galas, all to raise awareness. Estée Lauder says they have distributed more than 150 million pink ribbons at their beauty counters and illuminated more than 1,000 landmarks around the world. “Showy, expensive events and millions of pink ribbons are a distraction and ultimately amount to little more than empty awareness. Who isn’t aware of breast cancer today? The time, money and resources devoted to these practices could be better spent on meaningful change,” said Jaggar. Scientists and environmental health experts have long pointed to concern about hormone disruptors and other chemicals in cosmetics and beauty products that may increase the risk of breast cancer and interfere with treatments. “Twenty five years ago Estée Lauder put the first pink ribbons on their products that contain chemicals that may increase the risk of breast cancer and even interfere with treatments. We call this pinkwashing. And we are calling on Estée Lauder as the original pinkwasher to clean up their products and commit to the highest standards to protect women’s health,” Jaggar continued. Today, the pink ribbon is one of the most widely recognized symbols, and breast cancer awareness has ballooned into a multibillion dollar industry. “Breast cancer has become the darling of corporate America. Companies use the pink ribbon to sell their products and boost their image with consumers as they boost their bottom line. 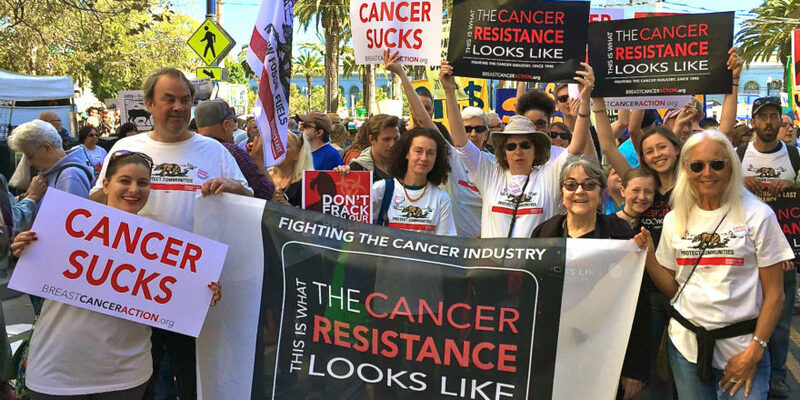 Major multimillion dollar cancer charities that do nothing to address the root causes of cancer often join with these companies. Meanwhile, breast cancer rates continue to rise every year. It’s why we call October ‘Breast Cancer Industry Month’,” continued Jaggar. Since its launch in 2002, Breast Cancer Action’s annual Think Before You Pink® campaign has called for transparency and accountability in breast cancer marketing and pink ribbon promotions. Breast Cancer Action coined the term pinkwashing to describe a company or organization that claims to care about breast cancer, but at the same time produces, manufactures and/or sells products that are linked to the disease. Over the 15 years of the campaign, Breast Cancer Action has forced numerous multibillion dollar corporations to change their ways. Find out more at https://www.bcaction.org. Breast Cancer Action (www.bcaction.org) is a national education and activist nonprofit organization whose mission is to achieve health justice for all women at risk of and living with breast cancer. BCAction has a strict conflict of interest policy and refuses to accept corporate funding from companies or organizations that profit from or contribute to the breast cancer epidemic. ← Join Us in Putting a Knot in the Pink Ribbon!